I wanted to take a break today from usual book posting to share something that happened to my friend, artist Lauren Nassef (the first artist I will be publishing as part of the BBIC press series). Yesterday she was alerted by someone who follows her blog that a graduate student from Falmouth University in the UK named Samantha Beeston had stolen her drawings and used them in her own work. 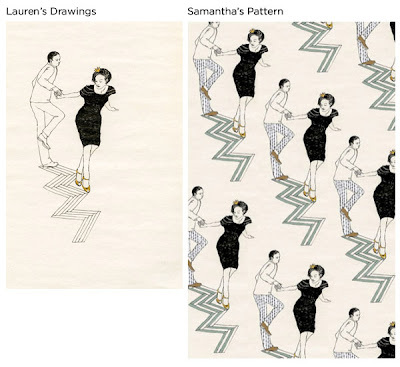 Once we starting doing more research, we found out Samantha won a huge award from Texprint for pattern designs filled with Lauren’s drawings which she claimed as her own. Even her website (which she has taken down since Lauren contacted her) had Lauren’s drawings on the home page and integrated thoughout her portfolio. She was even selling prints of one of Lauren’s drawings she had traced. With the award she won from Texprint (sponsored by Pantone Europe), she received prize money and a chance to exhibit at two trade shows in Hong Kong and Paris where she can take orders for the (stolen) designs. She even made a fake sketchbook with many of Lauren’s drawings traced or pasted in. ... Yesterday Lauren alerted everyone involved about what is going on, and since then most of the blogs have taken down or corrected their posts about Samantha’s work. The award and school have been notified so hopefully they’ll take the necessary actions soon enough. I wanted to write about this today because I am completely shocked and disturbed. I wanted to spread the word, to help Lauren be rightfully credited for her designs. I’m not sure what the lesson here is. Should we be more careful about putting our work online? How can we protect ourselves from incidences like this? I’ve heard horror stories of artists getting ripped off by huge corporations stealing their work. And I’ve seen artists “be inspired” by other artists in manner that is borderline plagiarism. In my opinion all you can do is treat the minor cases as flattery, sue when appropriate, and keep making original work! I hope this whole mess will just draw more positive attention to Lauren’s work, which I think is brilliant and beautiful. Read the whole post and see more images here and check out Lauren's great drawings here. By the way, her big Texprint art prize award has been taken back... see that here.